While passing over the Central Pacific Ocean, NASA's Terra satellite stared Hurricane Lane in the eye. Hurricane Lane continued to show a large eye surrounded by powerful storms. An infrared look by NASA's Terra satellite provided temperatures of those storms, confirming strong, high thunderstorms capable of very heavy rainfall. NOAA's Central Pacific Hurricane Center or CPHC cautioned on Tuesday, August 21, 2018, "Major Hurricane Lane expected to make a turn toward the Hawaiian Islands later this week." Interests in the main Hawaiian Islands and across the Northwestern Hawaiian Islands should continue to closely monitor the progress of Hurricane Lane. A Hurricane Watch may be required for portions of the main Hawaiian Islands on Tuesday. On Aug. 21 at 7:15 a.m. EDT (1115 UTC) the Moderate Resolution Imaging Spectroradiometer or MODIS instrument aboard NASA's Terra satellite analyzed Lane's cloud top temperatures in infrared light. MODIS found cloud top temperatures of strongest thunderstorms in the eyewall were as cold as or colder than minus 80 degrees Fahrenheit (minus 62.2 Celsius). They were surrounded by a larger area of storms with cloud tops as cold as minus 70 degrees Fahrenheit (minus 56.6 degrees Celsius).Cloud top temperatures that cold indicate strong storms that have the capability to create heavy rain. 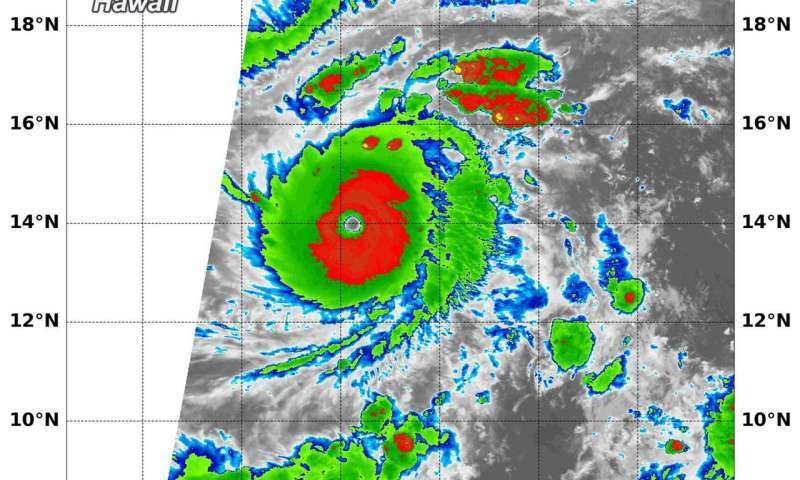 At 5 a.m. EDT (0900 UTC) on Aug. 21 or 11 p.m. HST on Aug. 21, the eye of Hurricane Lane was located by aircraft near latitude 14.0 degrees north and longitude 151.2 degrees west. Lane is moving toward the west near 12 mph (19 kph) and this motion is expected to continue through Tuesday, with some slowing in forward speed. A gradual turn toward the northwest is expected Wednesday into Thursday, Aug. 23. Maximum sustained winds are near 150 mph (240 kph) with higher gusts. Lane is a category 4 hurricane on the Saffir-Simpson Hurricane Wind Scale. Slight weakening is forecast over the next couple of days. CPHC said "Large swells generated by Lane will impact the Hawaiian Islands this week. These swells will produce large and potentially damaging surf along exposed shorelines. Excessive rainfall associated with Lane could affect portions of the Hawaiian Islands from Wednesday into the weekend, leading to flash flooding and mud slides."